My Little Patch of Sunshine: almost ready! The cookies are baked (cutouts, gingerbread, peanut blossoms and haystacks) and the presents are wrapped! Today I'm making a lasagna, frosting for the cutouts, and cinnamon rolls (to be baked in the morning.) I'm doing today & tomorrow's laundry so I don't get behind. The baby is actually napping off my body, so I can dust and sweep the livingroom. The boys are off on a bike ride with their dad. Later tonight, we'll take our annual holiday family picture in front of the tree, enjoy midnight mass and put the kids to bed. Tomorrow we'll relax in pajamas all day and enjoy watching the kids with their new gifts. I hope everyone enjoys a wonderfully blessed and merry Christmas! All the very best to you and yours. 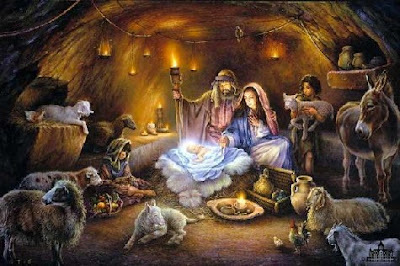 I pray for you a much blessed Christmas and a peaceful and contented New Year! Melanie, I hope you guys had a wonderful Blessed Christmas!